How to align social buttons ? Home » Tech Tips » How to align social buttons ? 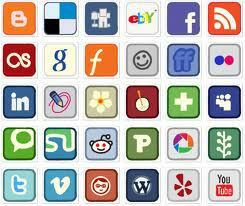 There is a huge list of social websites. Each social website provides its own social buttons. Since there are really no common standards for these social websites buttons, adding them on your website could be quite challenging. In order to add social media buttons to a website you need to understand how to align social buttons. There are a few scripts provided by some third party websites that can do all the hard work for you. As an example addthis.com is one such website. These scripts are however sometimes too slow or do not provide enough options to manage the social buttons you may be interested in. You can try and check if this works good for your site. If you want to add each of these social buttons on the site yourself it could be little tricky when it comes to aesthetics as there is no common standard on how these buttons written or rendered. This causes issues on alignment of the social buttons. A quick fix to align the social buttons is to use table html tag. The code below provides a sample using Plusone and Facebook. Table tag allows you to place each button in a separate column and then adjust it individually to align with other social buttons.